This unique, stylistically influential Gothic 'castle' began its life as a simple riverside villa. 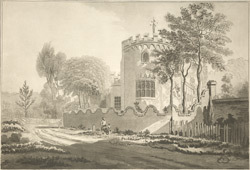 It was bought by Horace Walpole in 1748 and he soon after had the idea of converting the villa to a medieval castle. With the help of his friends, he scrutinised topographical prints, medieval buildings and tombs for design ideas. He added towers, spires, battlements, and arched windows to the exterior of the building, as seen in the picture. The effect was romantic and inspiring and his home became famous - a novelty in a world where plain, symmetrical classical buildings were accepted as the norm.